Geese There are 4 products. Jazz in Marciac is a huge music festival in the Gers. 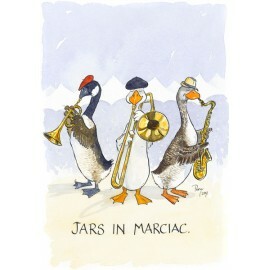 A ‘jar’ is French for a gander, a male goose. Reproduced as giclée print in various sizes, some with mounts. 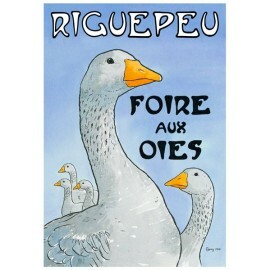 The foire aux oies is an annual event, held in Riguepeu, a small village in the Gers, where geese of all shapes and sizes are on show. Walking in a procession and on display with lots of other types of fowl. 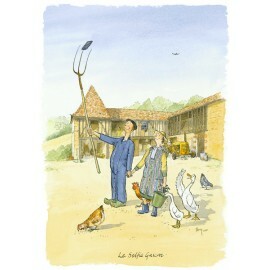 Reproduced as giclée print in various sizes, some with mounts. 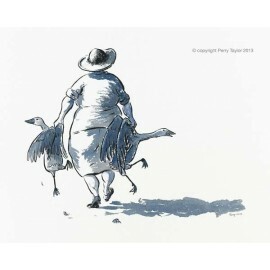 This well-built farmer's wife knows how to get two geese home from the foire aux oies. Indian ink, using a brush.